I recently watched the movie Life is Beautiful for the first time in about 10 years. It's a good thing, too, because I almost forgot how powerful a movie it is. For those of you that haven't seen the movie, it's a heart-tugging story about a Jewish man who is so positive, and so uplifting, that he even makes the most of a Nazi-era Concentration Camp. That movie, coupled with today's Gospel reading and the Easter season, led me to reflect on how beautiful our lives really are. Sure, we all have our issues, our struggles, and our crosses to endure. But they all pale in comparison to what life would be like if Jesus did not make the ultimate sacrifice for us, and if God wasn't eternally willing to forgive us. Imagine, for just one minute, that there was nothing to look forward to. That, after taking our last breath, our souls would languish in emptiness for eternity. Life would be pointless! Like a relatively short distraction on our way to perpetual gloom. But thanks to Christ, we have Hope. 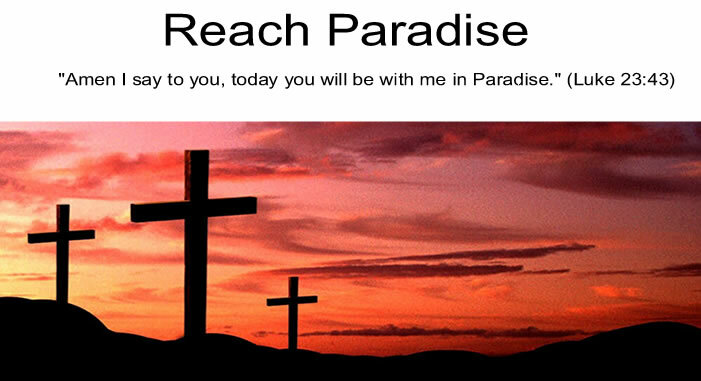 Hope that our lives are leading us to an eternity surrounded by God's love and joy in Paradise. That our future is a place where there is no sadness, no pain, and no emptiness. Just our Father's never ending beauty. Unfortunately, in the movie, Roberto Benigni's character is forced to make life beautiful for his son and everyone around him. Luckily, in the real world, Jesus has already done that for us. Life is beautiful so long as we invite God into it so that we can enjoy one even more beautiful in heaven. Thanks for this insightful reminder of that. Too bad Atheists don't understand the eternity facing their souls at death. Perhaps if they did, they too would Reach Paradise. Looking at the picture here of the blue sky and the flowers and trees I remeber the lyrics from Louis Armstrong's "What a wonderful world"
Life is beautiful and God is so good! I have never seen that movie, but what a coincidence, my niece just borrowed it to me! I can't wait to watch it! You're right, looking forward to heaven makes all of life worth living! I haven't seen the movie, but thank you for sharing the reminder about how beautiful life is. The thought of eternity without God is devastating, but what joy there is in the hope of eternity surrounded by God's love! I have never seen that movie but now you have sparked my interest. I can't imagine an emptiness after death. We are all so blessed in this life. We have so much to be thankful for. I could not go through life as a non believer. Even in my darkest moments I have my faith to hang on to. I can't not even begin to imagine what it would be like to have nothing. Life would be so bleak and unbearable. I LOVE that movie Michael! I blogged about it too awhile back and hope you don't mind if I share my link here. Thanks for the reminder about a sweet, sweet film. A beautiful post ... as always!